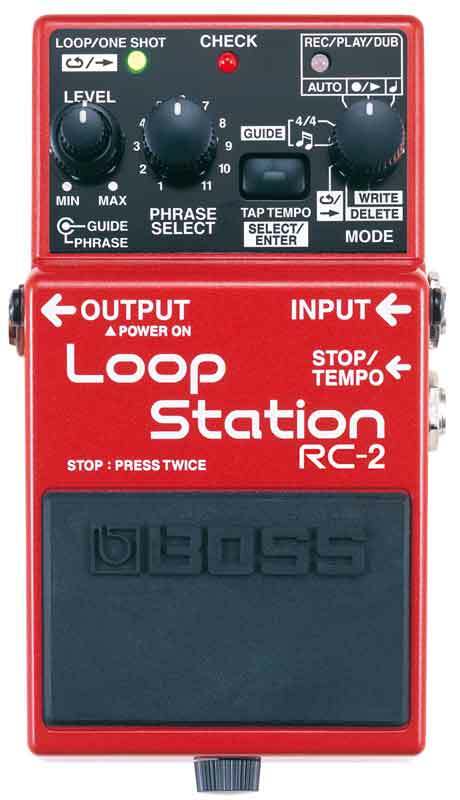 I’ve had my BOSS RC-2 Loop Station for almost three years now, and it has only been in the last month or so that I’ve actually put it to use on a regular basis. Frankly, I’m not too sure why I hadn’t used it. But since I’ve started using it, I’ve been having a blast! I think what inspired me to start using it was the release of the TC Electronic Ditto Looper. I was very impressed by its simplicity, and then it occurred to me that the RC-2 was actually very simple to use if memory served. So I set up the RC-2 with my VHT Special 6, and started to play around with it for a few days. To be honest, when I first started using it in those practice sessions, I was a little overwhelmed and intimidated, even with such a simple looper! But after awhile, I started to get the hang of it, and worked up the confidence to use it at my solo gig. I now use it quite a bit. Most of the time, I use it for specific songs like Bill Withers’ “Ain’t No Sunshine” or Clapton’s “Wondeful Tonight.” But lately, I’ve had some riffs pop into my head during my gig, and I’ll tap out a rhythm, lay down the rhythm guitar, then just jam over it. It has added a lot of life into my gig; mind you, I’m into my 13th year playing this weekly gig, so any way I can add a new dimension to it breaks up the monotony. Frankly, I don’t know if I’ll get another, more sophisticated looper. I’ve seen some amazing things people do with them, but for me, simple is good for right now. I was feeling a bit nostalgic yesterday and put my BOSS CE-2 on my board. Though I’ll never get rid of the pedal because of its value – both vintage and personal – I have to admit that I hadn’t played the pedal in at least year; maybe more, as I had moved on to other choruses such as the TC Electronic Corona Chorus and the Homebrew THC. But after playing it at my solo gig yesterday, I think it’ll definitely stay on my mini board. When I mentioned feeling nostalgic earlier, the CE-2 was my first chorus pedal. Actually, it was the first pedal I purchased back in the early 80’s. I had an original black label model circa 1981 or so (been awhile). I had purchased it along with an in-hole pickup for my Yamaha FG-335 and a Roland 15 Watt solid state amp, and actually put a lot of mileage on that pedal but finally traded it for another cheapo. For years, I could never recapture that tone, so I just went without it. But I never forgot the tone. Back in 2010, I purchased a green label, MIJ model from the mid-80’s, and played it for several months until I came across my other two chorus pedals that I mentioned above. Unfortunately, it didn’t really work well with my Plexi-style amps, so I just took it off my board. It sat collecting dust until I played it yesterday. It hit me like a ton of bricks yesterday that what made me fall in love with the sound was how it sounded with an acoustic guitar. The chorus is voiced a bit bright, so the deep voice of an acoustic balances out the potentially harsh tones. I was very much in tonal heaven yesterday as that pedal just added so much to my acoustic tone. I could set it to thick and liquid, to very subtle and it just sounded fantastic. Here are a few clips I recorded this morning. I’m playing my Gretch Electromatic and outputting through my VHT Special 6. The amp is miked with a Sennheiser e609 positioned off-axis, at the edge of the speaker cone to pick up the lows. The first two clips are short comparison clips, while the third is finger-picked chord progression. No EQ was used on the recording. What you heard was a straight recording of the amp’s output. I did level balance a bit to bring up the softer, finger-picked tracks, but did no EQ shaping. The thing about the CE-2 tone is that it is not a thick chorus tone, and it is not smooth. There is a definite emphasis on the mids and high-mids with the CE-2, which is probably why it didn’t sound very good with my Plexi-style amps, plus the fact that I was using Alnico speakers which tended to be bright. So the added brightness was just not too pleasing at the time. Mind you, that was for my live sound. I could always get a good recorded sound by simply positioning my mic in the right place. The problem with evalutating pedals online is that you can’t really audition them very easily – especially in combination with other pedals. But BOSS has gotten us one step closer with the new BOSS VPB-2 or Virtual Pedal Board. It’s very cool in concept. You go to the VPB site, select a style of music and a combination of pedals appears on the page. A loop in the style you’ve chosen begins playing, and you can then activate/and de-activate pedals to see how they change the recorded signal just by clicking on them. You can also swap some of the pedals out for the current style.